Get your start in robotics and making things move! 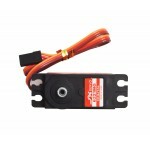 The 6221MG is an excellent choice for a high torque, digital metal geared servo. It comes in a standard large size and its metal gears mean when the motor is in a jam, the gears aren’t likely to strip. This large servo will rotate up to 60 degrees. This servo with its metal gears is a little hefty and comes in at 62g, and is a good choice for medium-large sized projects. Each servo comes with 3 arms and screws and with pre-soldered female wires. When using servos, we recommend using pin 9 or 10, a standard in the Servo library. It's easy to fry servos, make sure you plug it into your brain correctly. For a high-performing, high torque servo, look no further. What you pay in price you make up for in reliability and steadiness.. This little servo is analog and brings 1.8kg torque and metal gears to all your projects requiring these little actuators..